The Kering Foundation announces two partnerships to mark its commitment to combat sexual assault on campuses in the U.S. The Kering Foundation signs a partnership with Generation Progress’ initiative “It’s on Us” toaddress and shift the cultural dialogue around sexual assault on college campuses. The Kering Corporate Foundation, which combats violence againstwomen, announced its commitment to prevent and fight sexual violence in the US, focusing on collegecampuses through support to two American organizations at an event at the French Consulate. First, the Foundation named We End Violence, a social business based on prevention against sexualviolence, the winner of the Kering Foundation’s 2015 Social Entrepreneur Award inthe Americas. We End Violence provides an innovative model to raise awareness and change behavioursleading to gender-based violence. The organisation is committed to creating a culture where it issafe for survivors of sexual violence to share their stories and heal; to change the cultural myths and norms of discrimination; to encourage men to see their role in preventingviolence; and to build alliances that will empower more people to speak out. Since 2006, We EndViolence has assisted 10,000 direct beneficiaries and 15,000 indirect beneficiaries. We End Violence will benefit from a 2-year support, including a grant of €30,000 (nearly$34,000) as well as mentoring by a Kering Group senior manager, with the goals of strengthening theirmarketing and communication strategy. “We formed We End Violence to push forward the movement to end gender-based violence. We welcome the support and involvement of the Kering Foundation in reaching that goal” said Carol Mosely, one of the founders of We End Violence. This year, with the support of Geneva Global, a philanthropic consulting firm with expertise on social entrepreneurship, the Kering Foundation screened several projects, launched three due diligences and after complementary interviews, ultimately selected two finalists. The Social Entrepreneur Awards continually draw from a strong pool of highly-competitive, visionary, and talented candidates. Since 2009, the Awards have supported six social entrepreneurs around the world. In addition to today’s award in the Americas, the Kering Foundation also rewarded Starfish Project as 2015 winner in China. During the ceremony, the Kering Foundation also announced its new partnership with Generation Progress and “It’s On Us” campaign, whose mission is to make College campuses safer. “It’s On Us” is a cultural movement aimed at fundamentally shifting the way we think about sexual assault on college campuses. To change the public narrative on sexual assault, “It’s On Us” engages a diverse set of partners and works with local student organizers to build campaigns and implement policy change on their campuses. Through this partnership, the Kering Foundation will support the production and distribution of future campaign Public Service Announcements (PSAs) and culture change initiatives on college campuses. 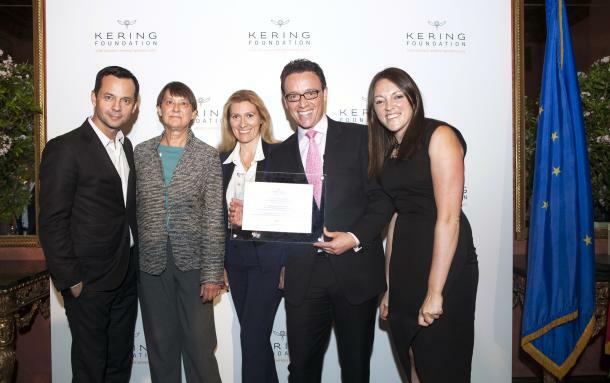 “The Kering Foundation chooses a specific cause to tackle in each area where it works. In the U.S., 1 in 5 college women experiences sexual assault. College campuses are among the most dangerous places for women and it’s also the most important place to initiate behavior change.” said Laurent Claquin, Head of Kering Americas and board member of the Kering Foundation.